The Royal Mail found that traffic in London was a problem even before automobiles were widely used and available. In one of the busiest cities in the world getting from point “A” to point “B” has been a problem for over 100 years. However, London is a pioneer when it comes to regulating traffic. For instance, in 1868 the city instituted the very first traffic signal to provide safe passage for pedestrians at the intersection of George and Bridge streets near Parliament. Even though the car was not yet invented, the city was choked with horse-drawn carriages. City planners have tried to tackle the congestion in London to ensure the safety and efficiency of transportation for drivers, bikers, and pedestrians for years. However, one of the most fascinating feats of efficient transport carried no passengers and had no drivers. The London Post Office Railway carried mail from the Head District Sorting offices in Padington to the Eastern sorting office in Whitechapel. The railway operated from February 1927 until May 2003 and carried mail to nine different sorting facilities along its route, two of them being main sorting centers for the city. The six and a half mile (10.5 km) long route is 70 feet (21 meters) below the streets of London and could travel the entire length, making all stops, in about 26 minutes. It ran 19 hours a day, 286 days a year and once carried roughly 4 million letters per day, but as years passed and sorting facilities were relocated the railway began to see less and less usage. Several extensions were proposed to the line that would have added eleven new stops to the route. Although the extensions were started during the initial construction of the line, the lines were never fully built. They plans remained on the books for years, but the costs of building these new stops were never able to outweigh the potential benefits. This solution for transporting mail to sorting facilities is one of a kind and remained in use for over 75 years. Bypassing the congested streets of London allowed for mail to be transported without delay. However, a Royal Mail press release in April 2003 announced that the line would be closed. Royal Mail explained that using the railway was roughly five times more expensive than road transport, at 1.2 million British Pounds a day. New technologies have contributed to a large decline of usage for traditional mail. Since just about everyone is using email, the need to transport letters has fallen considerably. Additionally, competition between state mail delivery and private business has further pushed Royal Mail into a growing deficit. And so on the 30th of May 2003 the underground railway ceased all operations. 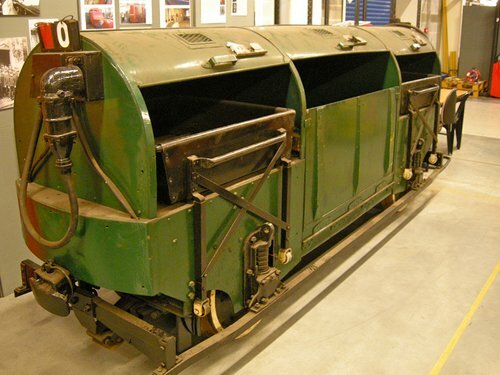 However, three of the railway trains were removed and preserved at the British Postal Museum. This unique solution to the over congested streets of London was adopted to avoid unexpected and unacceptable delays, but due to excessive losses from decreased use of Royal Mail services, the railway became to expensive to maintain. Although the track had nine stops along its route, it was only delivering to three of them when it closed. Sorting facilities were relocated and would need new tunnels and tracks to be built in order to continue using the rail. Although the railway was removed from active service, the lines still exist and are reportedly in surprisingly good condition. Despite some degradation from age and disuse, the line is still intact. It is unlikely that the system will ever be adopted again in the near future, but if the congested streets of London ever prove too slow for mail delivery, maybe the railway will return to service. This article was a paid contribution by Matthew R, a Freelance Writer based in Philadelphia, USA. He can be found on the People Per Hour website. Our resident science writer, James, has a long history of posts on Interesting Everything. James lives with his wife and british bulldog George in Aberdeen, Scotland. What a fantastic hidden infrastructure.Shame it can’t be turned into a museum for now !